In the decade since 2002, the value of leather exports in Bangladesh has grown by an average of $41 million per year. From June 2011 to July 2012 Bangladesh exported around $663 million of leather and leather goods, including footwear. This leather is exported to some 70 countries throughout the world, but principally China, South Korea, Japan, Italy, Germany, Spain, and the United States. (New York, October 9, 2012) – Workers in many leather tanneries in the Hazaribagh neighborhood of Dhaka, the Bangladesh capital, including children as young as 11, become ill because of exposure to hazardous chemicals and are injured in horrific workplace accidents, Human Rights Watch said in a report released today. The tanneries, which export hundreds of millions of dollars in leather for luxury goods throughout the world, spew pollutants into surrounding communities. The 101-page report, “Toxic Tanneries: The Health Repercussions of Bangladesh’s Hazaribagh Leather,” documents an occupational health and safety crisis among tannery workers, both men and women, including skin diseases and respiratory illnesses caused by exposure to tanning chemicals, and limb amputations caused by accidents in dangerous tannery machinery. Residents of Hazaribagh slums complain of illnesses such as fevers, skin diseases, respiratory problems, and diarrhea, caused by the extreme tannery pollution of air, water, and soil. The government has not protected the right to health of the workers and residents, has consistently failed to enforce labor or environmental laws in Hazaribagh, and has ignored High Court orders to clean up these tanneries. Government officials told Human Rights Watch that they do not enforce environmental or labor laws with respect to Hazaribagh’s tanneries, an estimated 90 percent of the tanneries in Bangladesh. 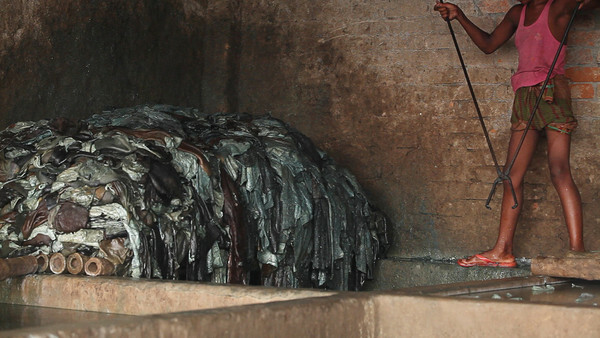 The Hazaribagh tanneries employ up to 15,000 workers. In the words of a senior official in Bangladesh’s Environment Department, “We are not doing anything for Hazaribagh.” The government’s inaction is due to a de facto understanding by the Environment Department not to enforce environmental laws in Hazaribagh while the government plans the relocation of the tanneries, and a Labor Inspectorate that lacks manpower and prioritizes good relations with management. Under international law, the government is required to take reasonable steps to protect the right to health of everyone in its territory. Jahaj, 17, has worked in a tannery since he was 12. He suffers from asthma, as well as rashes, itches, and acid burns. Jahaj particularly dislikes working in the pits that that hold hides and many of the diluted chemicals used to cure them. Workers told Human Rights Watch that many tanneries did not supply appropriate or sufficient protective equipment or training to work with the harmful chemicals and aging machinery. Some managers deny sick leave or compensation to workers who fall ill or who are injured on the job, in violation of Bangladeshi law. Human Rights Watch interviewed children, some as young as 11, working in tanneries. They were engaged in hazardous work, such as soaking hides in chemicals, cutting tanned hides with razorblades, and operating dangerous tanning machinery. Women and girls said that they are paid comparatively less than men and that, in addition to their own work, they must also perform tasks normally performed by men. The wastewater that pours off tannery floors and into Hazaribagh’s open gutters and eventually Dhaka’s main river contains, among other substances, animal flesh, sulfuric acid, chromium, and lead. The government estimates that about 21,000 cubic meters of untreated effluent is released each day in Hazaribagh. Government officials and tannery industry representatives told Human Rights Watch that no Hazaribagh tannery has an effluent treatment plant to treat its waste, which can have many thousands of times the legally permitted concentrations of pollutants. Since 2001 the government has ignored a ruling from the High Court Division of the Bangladesh Supreme Court ordering the government to ensure that the Hazaribagh tanneries install adequate waste treatment systems. The government has sought extensions to a 2009 High Court order to relocate the Hazaribagh tanneries out of Dhaka, and then ignored the order when the extension passed. A government plan to relocate the tanneries to a dedicated site outside of Dhaka by 2005 has faced numerous bureaucratic delays. Meanwhile the country’s two main tannery associations continue to seek even greater compensation than the amount initially agreed upon from the government for the relocation.